ഓം സിന്ദൂരാരുണവിഗ്രഹാം ത്രിനയനാം മാണിക്യമൗലി സ്ഫുരത്- താരാനായകശേഖരാം സ്മിതമുഖീ- മാപീനവക്ഷോരുഹാം പാണിഭ്യാമളിപൂർണ്ണരത്നചഷകം രക്തോത്പലം ബിഭ്രതീം സൗമ്യാം രത്നഘടസ്ഥ രക്തചരണാം ധ്യായേത് പരാമംബികാം. Ramapuram Bharanikavu Devi Temple is one of the oldest and important temple of Kerala. 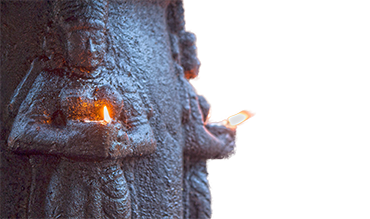 It is a rare place of worship as the temple homes to two goddess with equal importance. Sree Bhuvaneswari(Sree Parvathi) the goddess of eight fold prosperity abiding on sreechakra is seated in sanctity facing the east and Sree Bhadrakali ,the destroyer of evil doers and the protector of good selves and the embodiment of boundless power is seated in sanctity facing the north and reigns in the fullness of glory. Ramapurathamma( Sree Bhuvaneswari) is considered as the Kingdome deity of Odanadu(Kayamkulam Kingdome) [Odanadu Rulers].After stealing the Sreechakrom,sanctified at sanctum of Ramapurathamma ,the then Trippappur king Marthandavarma and his Chief [Dalava] Ramayyan had conquered Kayamkulam .The absence of the most sacred Sreechakram rendered them powerless and it paved the way for Marthanda Varma to establish his supremacy over Kayamkulam dynasty.